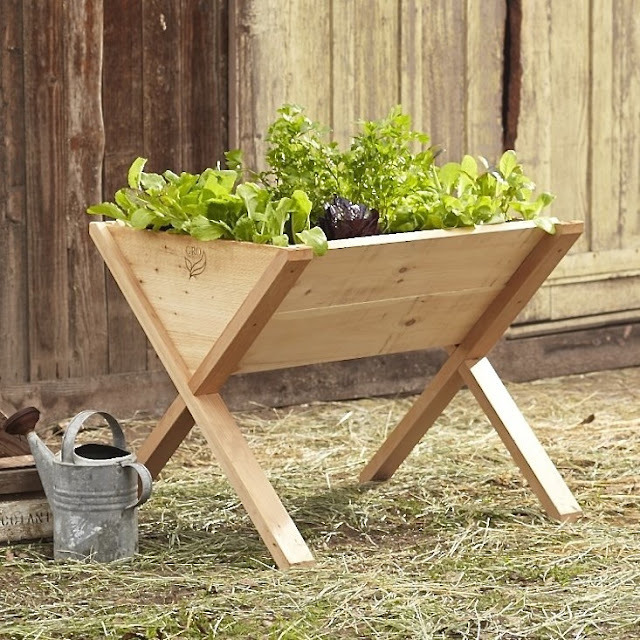 Raised garden beds, they seem to be the way to grow these days, so if you have been thinking of making some for yourself and are looking for some inspiration, look no further. 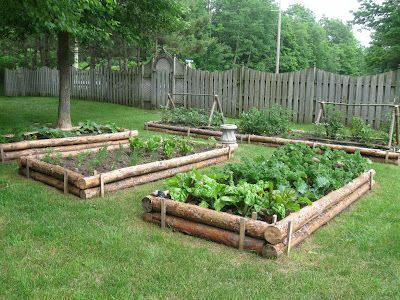 Use logs to impart a rustic feel to your raised beds. 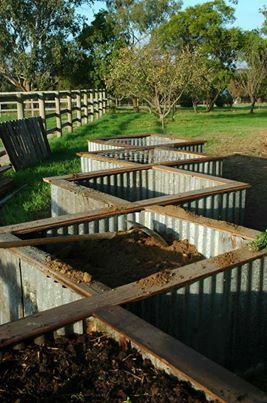 You could also get that rustic look by using old corrugated galvanised steel in different shapes. Credit for this image has been given to this website, but I have been unable to find it there. 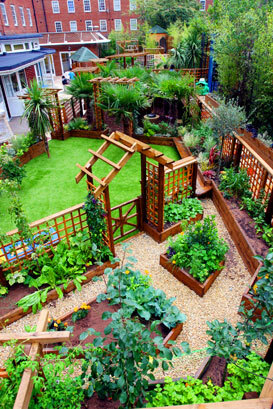 This gorgeous garden is actually part of a school playground in Clapham, London, I think all schools should follow this example. 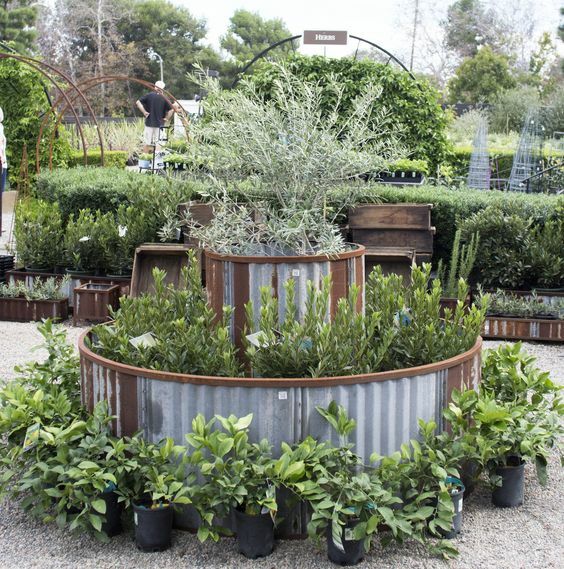 Try using different shapes in the garden to add some visual interest like this garden designed by Casa Smith Designs. 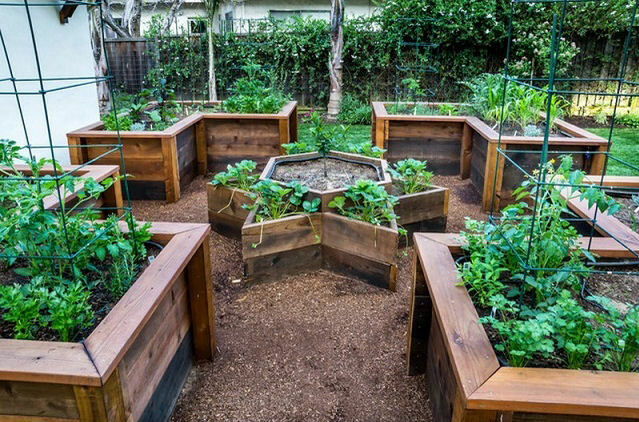 The owners of this garden have planted a dwarf lemon tree in the centre of the star bed. 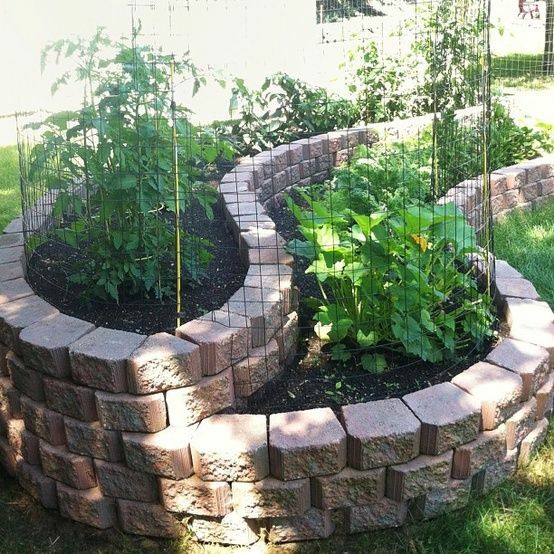 Using retaining wall blocks makes it easy to add curves to raised beds. 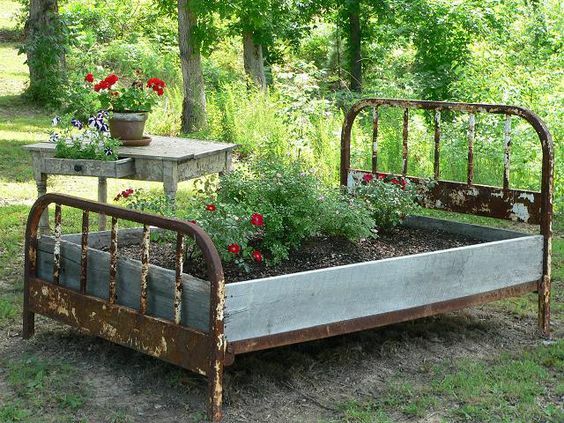 Add some whimsy to your vegetable garden by using a bed as a bed. 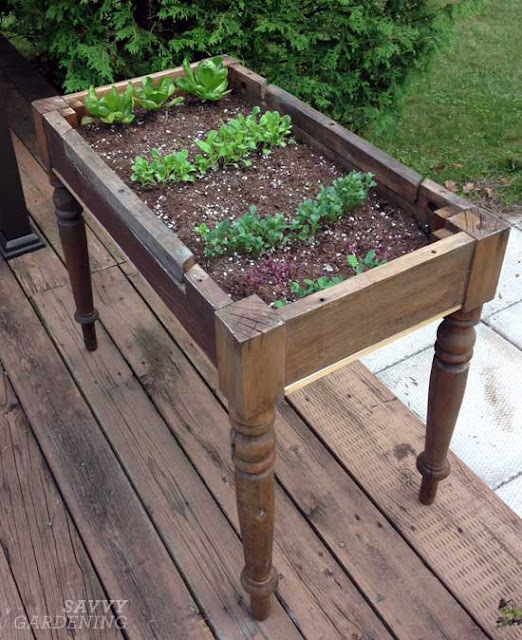 If you only have a small space to grow in try one of these ideas. So there you are, just a few ideas to get you started, if you decide to use one of these ideas let me know I'd love to see it. This post was meant to be my last one for 2016, but I got busy with other things so instead it is my first post for the brand new year. While I might not enjoy the heat of summer it seems the garden does. The butternut pumpkins are doing fantastically well this year and are starting to outgrow their beds and onto the pathway, they are producing lots of female flowers which I hope the bees are busy pollinating. The zucchinis are doing the best of all the vegetables I planted and are all ready providing me with more than I really need, I don't know what I'm going to do once they really get going. The green ones are sweet and creamy, totally different to shop bought ones. The Yellow Crookneck has a much firmer texture than the green ones, but they taste good and at the end of the day that is what it is all about. The watermelon and rockmelon (cantaloupe) are covered in flowers so fruit shouldn't be too far off. and the tassels are starting to emerge. I waited too long between planting the first and second lot of corn and so it will be quite a few weeks before the second crop of corn is ready which may not be a bad thing. The only pumpkin that seems to have been successfully pollinated so far. took a turn for the worse and looked like it might die, luckily it seems to be recovering now and is starting to put on some new healthy looking growth and maybe even some more pumpkins. suddenly turned up their toes and died. The unnamed volunteer that popped up in the garden and is still unnamed, but I'm starting to suspect it might be a Kent pumpkin is going great guns and there is the real possibility that it could take over the melon garden if I'm not careful. The eggplant that I overwintered, survived the powdery mildew and has started to produce fruit again and will shortly be joined by two more eggplant, a Rosa Bianca and a Snowy. My last job for December was potting up the very slow to grow tomato seedlings. I honestly did not think that the tomato grown from store bought seed was ever going to get big enough to transplant into larger pots, in contrast the ones that were grown from store bought tomatoes, sliced, and lain on top of the soil are much further ahead with their growth and look healthier too. 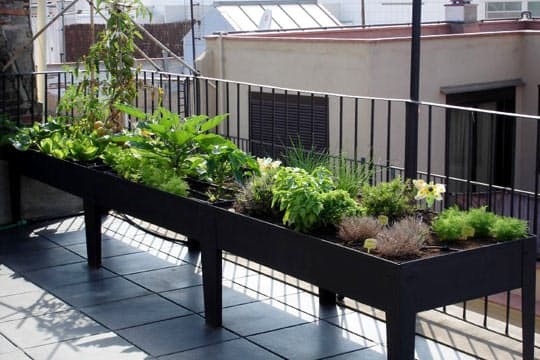 Hopefully now they are all in pots they will flourish. Tomato seedling grown from store bought tomatoes. This one was grown from shop bought seed. Just a couple more photos to share of the damage done by the storm that came through South Australia last week. The trellis that I had been using to hold the shade cloth off the corn was blown over, luckily the corn was only bent not broken and was standing up straight again by that same afternoon. The damage that upset me the most was my greenhouse which was a birthday present from my daughters last year. Even though it was tied down and had survived other storms this time it ended up over the neighbours fence and is unfortunately beyond repair. I know I'm lucky to have sustained such minor damage it could have been so much worse and was for a lot of people. So, that was the garden in December, I'm expecting a lot more produce to come out of it over the next few weeks and I will be back at the end of this month with another update. Wishing you all a HAPPY NEW YEAR and I hope the year ahead brings us all an abundance of the very best that life has to offer.